Water quality in the upper Tongue River from Monarch, Wyoming, downstream to just upstream from the Tongue River Reservoir in Montana potentially could be affected by discharge of coal-bed methane (CBM) production water (hereinafter referred to as CBM discharge). CBM discharge typically contains high concentrations of sodium and other ions that could increase dissolved-solids (salt) concentrations, specific conductance (SC), and sodium-adsorption ratio (SAR) in the river. Increased inputs of sodium and other ions have the potential to alter the river’s suitability for agricultural irrigation and aquatic ecosystems. Data from two large tributaries, Goose Creek and Prairie Dog Creek, indicate that these tributaries were large contributors to the increase in SC and SAR in the Tongue River. However, water-quality data were not available for most of the smaller inflows, such as small tributaries, irrigation-return flows, and CBM discharges. Thus, effects of these inflows on the water quality of the Tongue River were not well documented. Effects of these small inflows might be subtle and difficult to determine without more extensive data collection to describe spatial patterns. Therefore, synoptic water-quality sampling trips were conducted in September 2005 and April 2006 to provide a spatially detailed profile of the downstream changes in water quality in this reach of the Tongue River. The purpose of this report is to describe these downstream changes in water quality and to estimate the potential water-quality effects of CBM discharge in the upper Tongue River. Specific conductance of the Tongue River through the study reach increased from 420 to 625 microsiemens per centimeter (µS/cm; or 49 percent) in the downstream direction in September 2005 and from 373 to 543 µS/cm (46 percent) in April 2006. Large increases (12 to 24 percent) were measured immediately downstream from Goose Creek and Prairie Dog Creek during both sampling trips. Increases attributed to direct CBM discharges were smaller. In September 2005, the SC of 12 measured CBM discharges ranged from 1,750 to 2,440 µS/cm, and the combined discharges increased SC in the river by an estimated 4.5 percent. In April 2006, the SC of eight measured CBM discharges ranged from 1,720 to 2,070 μS/cm; the largest of these discharges likely increased SC in the river by 5.8 percent. Estimates of potential effects of the CBM discharges on the SC of the Tongue River near the Tongue River Reservoir were calculated using a two-step process involving linear regression and mass-balance calculations for a range of streamflow and CBM-discharge conditions. Potential effects from CBM discharges are larger increases of SC and SAR at lower flows than at higher flows and relative increases that are substantially smaller for SC than for SAR. For example, if the streamflow was 100 cubic feet per second (ft3/s) in the Tongue River near the Tongue River Reservoir and CBM discharge ranged from 1,250 to 5,000 gallons per minute, the projected increases would range from 4.4 to 16 percent for SC and from 39 to 151 percent for SAR. In comparison, if the streamflow was 600 ft3/s, the projected increases would range from 2.2 to 8.4 percent for SC and from 21 to 79 percent for SAR. This analysis of potential water-quality effects on the SC and SAR of the Tongue River in the study area assumes that the quantity and quality of water flowing into the study reach at the time of this study was the same as during the period before CBM development (data from water years 1985–99). 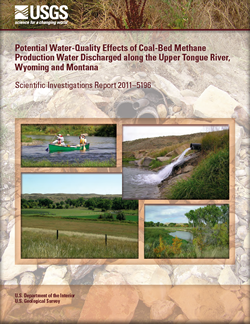 Kinsey, S.M., and Nimick, D.A., 2011, Potential water-quality effects of coal-bed methane production water discharged along the upper Tongue River, Wyoming and Montana: U.S. Geological Survey Scientific Investigations Report 2011–5196, 28 p.